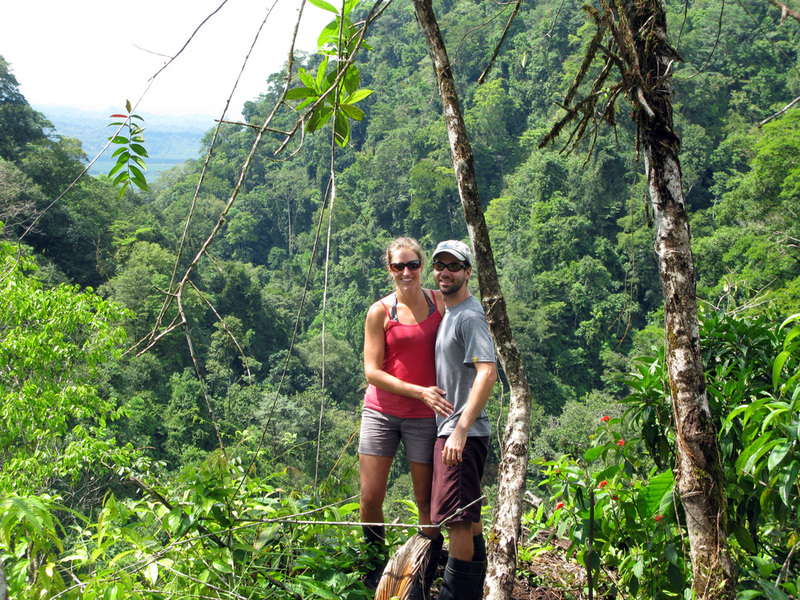 For a few years now we have both been looking forward to visiting Finca Bellavista, Matt & Erica Hogan’s tree house community in southern Costa Rica. We’ve followed along on their website as they’ve been building the infrastructure for what is now becoming an incredible neighborhood in the trees. So on our last week in Costa Rica we decided to rent a little 4×4 (the Finca is remote, not easily accessed by public transport) and head down to the southern zone to finally check the place out for ourselves. It was a tough drive from San Jose and we arrived at the Finca just after dark. Our lousy rental, a Dihatsu Terios with 184,000 KM, had seen better days. The battery died at our lunch stop in Jaco (left the lights on), but luckily a fellow American with a Jeep Cherokee gave us a tow until I could pop the clutch and get the tiny engine going again. We tried to roll start it unsuccessfully and probably flooded the engine after the first few attempts. Saved by a Cherokee! How fitting. Ahh we miss the Jeep! 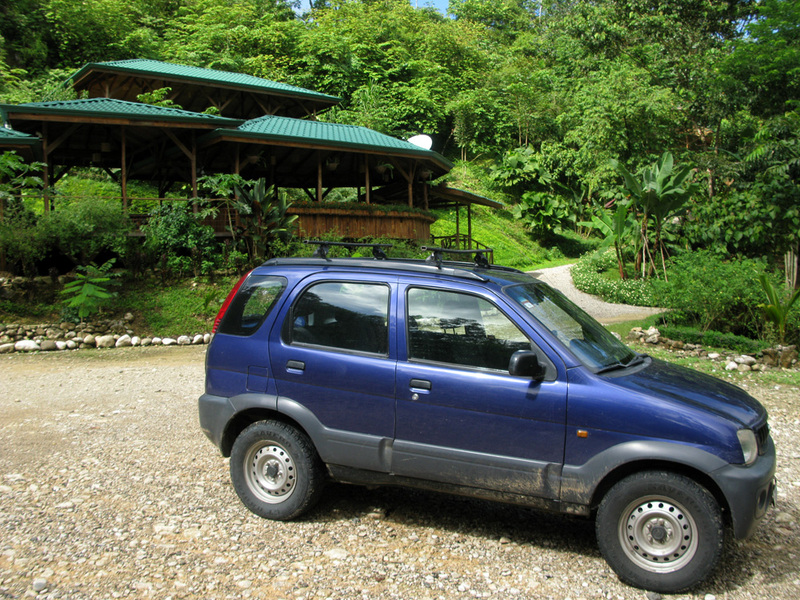 All was forgotten of the long drive after we arrived at the marvelous Finca Bellavista. Matt & Erica made us feel right at home and must be thanked again for their warm hospitality. They had returned the day before from a deep-sea fishing trip with a couple hundred pounds of fresh Dorado, Amberjack, Snapper etc… And luckily for us no one else was staying at the Finca that week, so we had to help them eat it all! Awesome meals ensued and we were living fat and happy in our river side cabina for a few days. Our Dihatsu brought us to the Finca base camp. 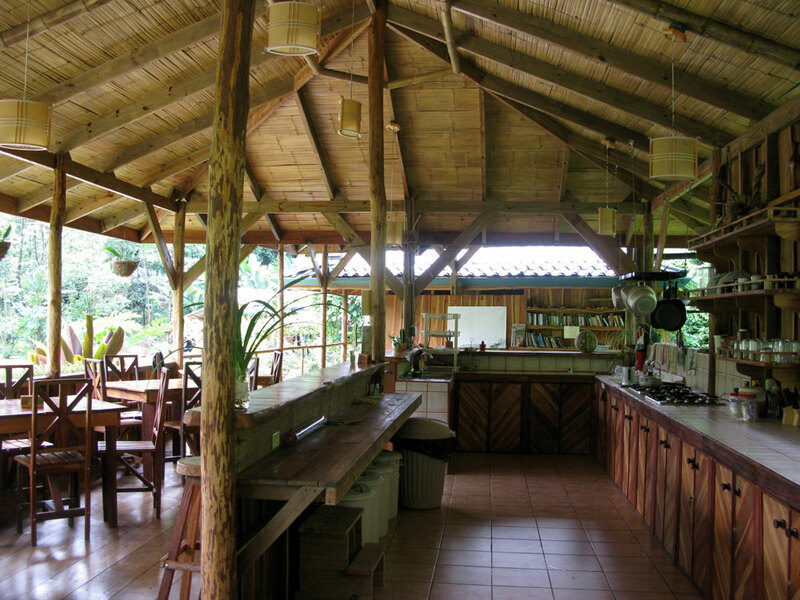 The comfy communal kitchen and dining pavilion at Finca Bellavista. The next day they gave us the grand tour of the Finca via zip line and trail through the property. We were simply blown away. This place is spectacular in its natural beauty, vision and craftsmanship. A reflection of the years of hard work that the Hogan’s have dedicated to the place. 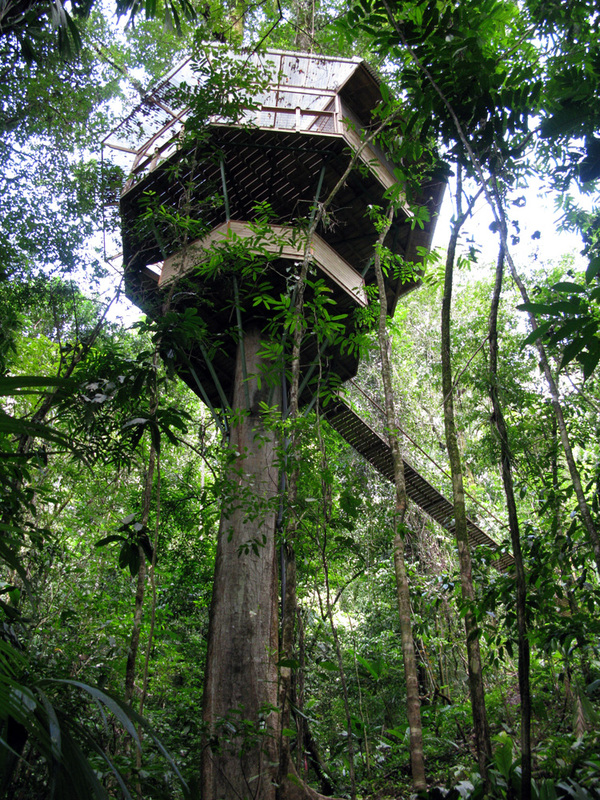 With over fifteen zip lines throughout the property it was easy to get around to all of the awesome tree houses, swimming holes, and viewpoints. If you haven’t already checked out their website, do so now. We couldn’t help thinking about ending our travels here, buying a lot and building a tree house of our own. We’ll just have to figure out how to make a living down here, and then we’ll be back! I could see myself doing freelance web work via satellite and exploring the whole area by mountain bike… It’s a very compelling place. Thanks again Matt & Erica! High speed high five on the zip lines. 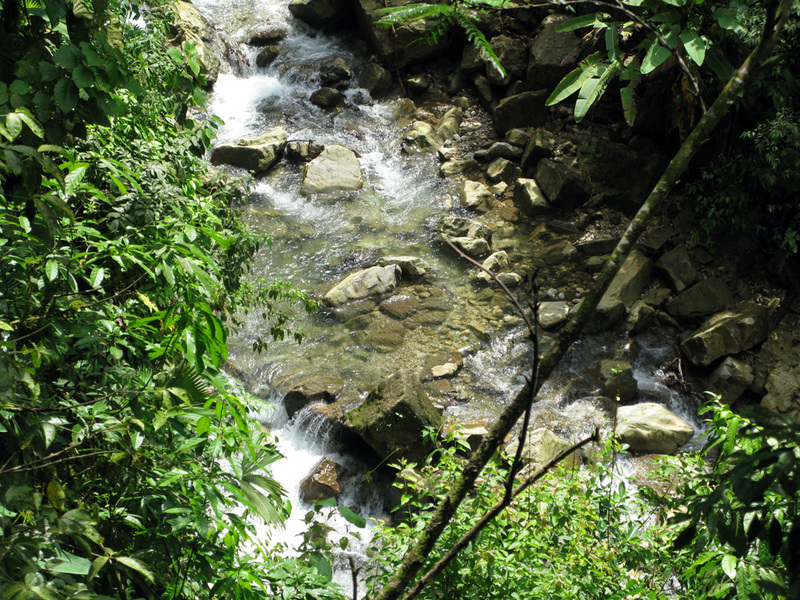 Looking down on one of the clear rivers running through the Finca. 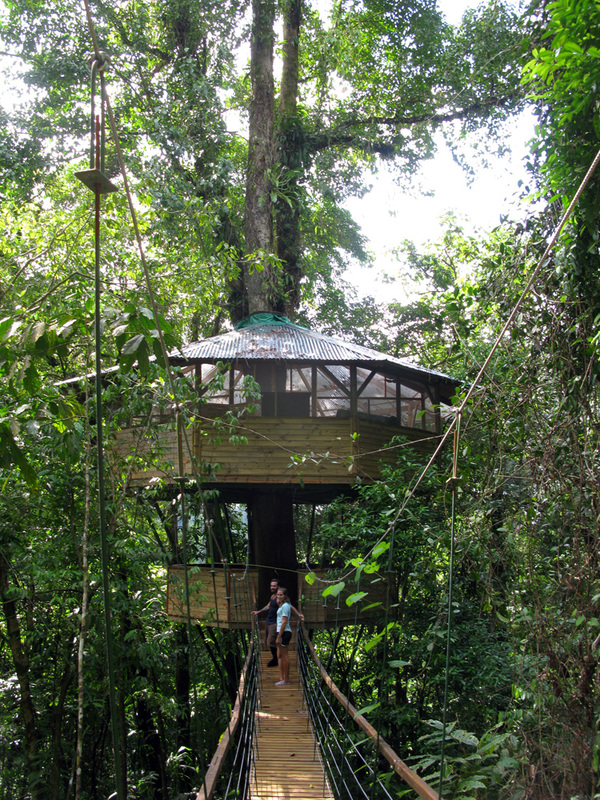 An awesome example of tree house living, this one belongs to Finca resident. An impressive full kitchen in one of the newest tree houses on the property. Lots of little creative features make every tree house unique. On our hike out to The Point. After three days of exploring the Finca, Thanksgiving was only a day away. 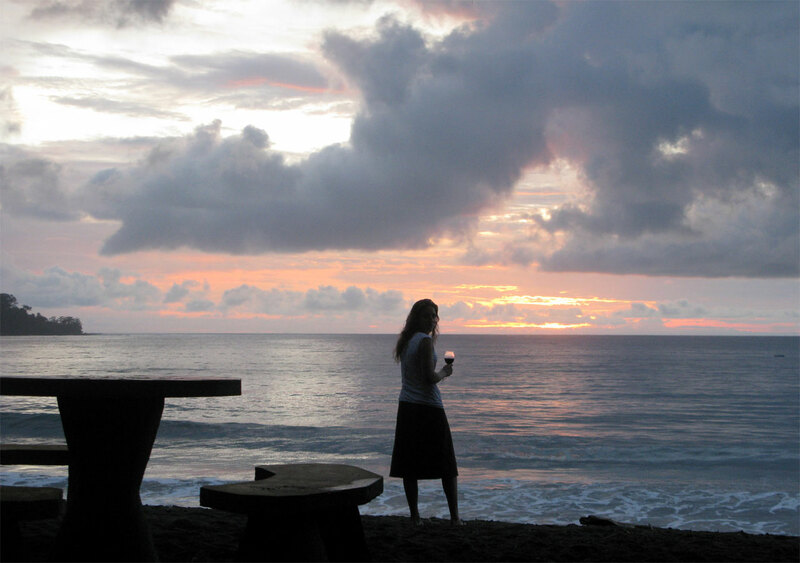 Luckily for us Matt & Erica have a friend with a resort on the coast next to Corcovado National Park. They suggested that we all head out there to relax and celebrate the holiday. Poor Man’s Paradise was the name of the place and it was a fun hour long boat ride out to the coast through mangroves and then open ocean. For two days and nights we rode waves, walked the beaches, watched monkeys and scarlet macaws and played some vicious rounds of UNO (Dutch style). It was so nice to be with friends from the states for a while, and topped it off with a tasty Thanksgiving dinner of chicken and mashed potatoes. We missed being with our families for the holiday but enjoyed the company and had a great time at PMP. Sundowners at Poor Mans Paradise. Matt & Erica enjoy Thanksgiving. Instead of the usual black Friday shopping, we hit the road towards San Jose and spent the afternoon and evening on the coast at Playa Hermosa a world-class surf break. Then on Saturday we got up early to return the Dihatsu to San Jose. The capital of Costa Rica has been a comfortable base for us as we’ve explored the region, this was our third stop there and it started to feel like home. Costa Rica Guest House has been our base there; it’s just up the street from the Supreme Court in a nice neighborhood near the city center. We’ve enjoyed all of the excellent restaurants nearby and on our last night we went out to the movies, luckily for me the film was in English! 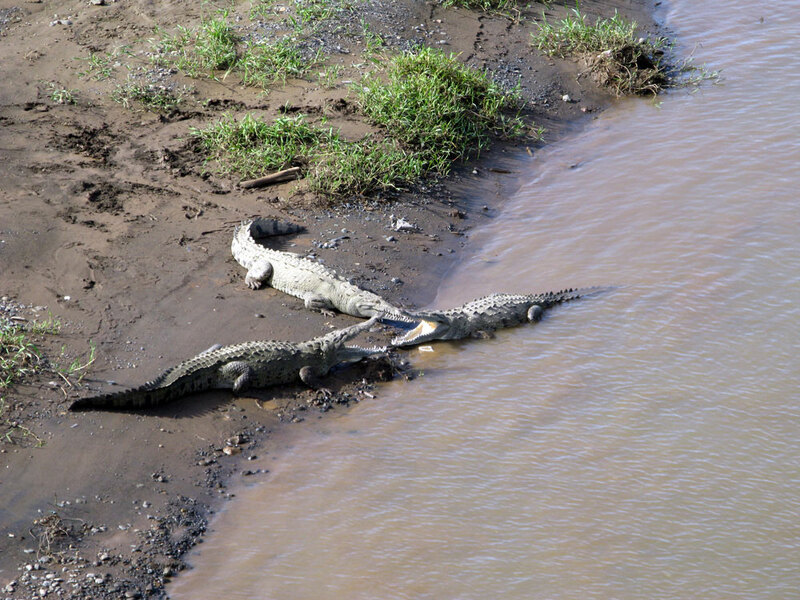 Some man-eater sized crocs on the drive back to San Jose. We said our goodbyes to Costa Rica and continued our southern journey to Panama, eventually getting to the Caribbean island: Bocas del Toro. We’ve been here for four days now and have enjoyed the food, surf, beaches, SCUBA diving and snorkeling. On the bus ride down here we met Paul and Tamsin, a couple from England/New Zealand who are on a similar trip. 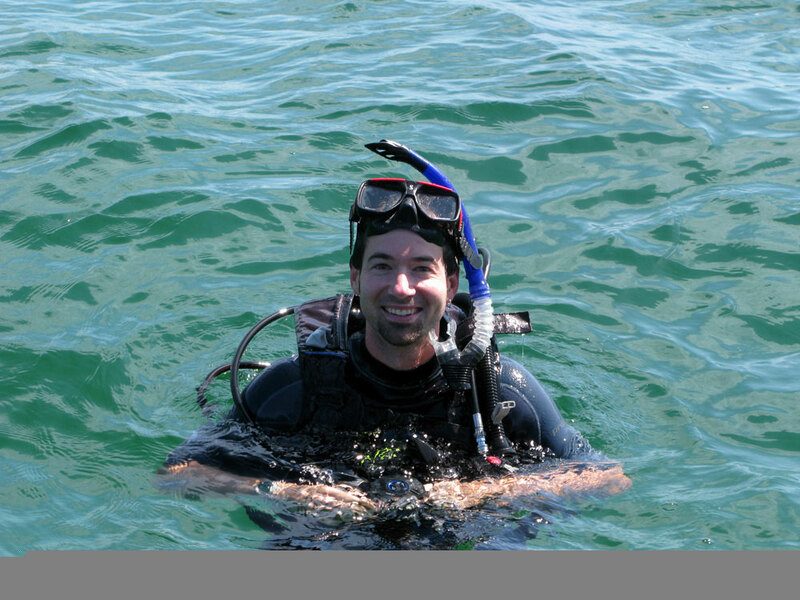 We both stayed at the same hotel and had a great time dining and diving together. 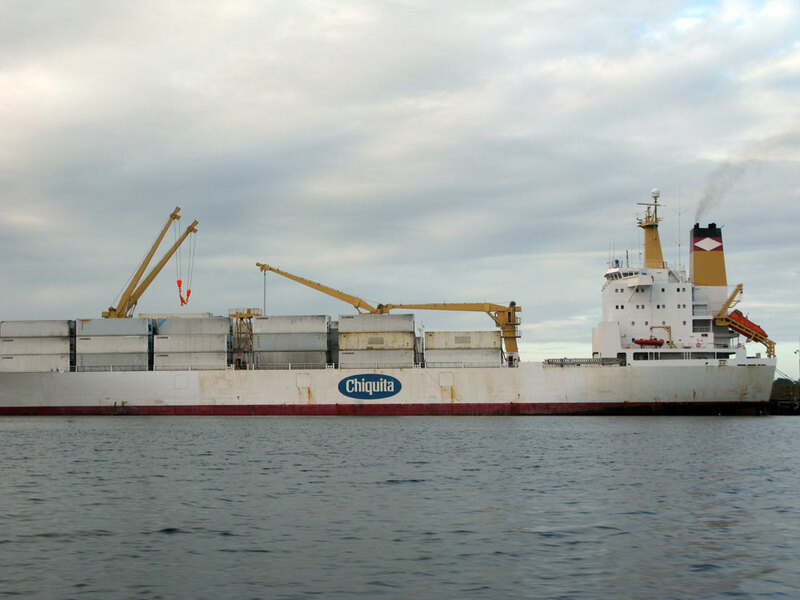 Tomorrow we plan to go back to mainland to David, Panama’s second largest city. We’ll then work our way towards Panama City and visit the great Panama Canal. A real banana boat on the ride out Bocas del Toro. 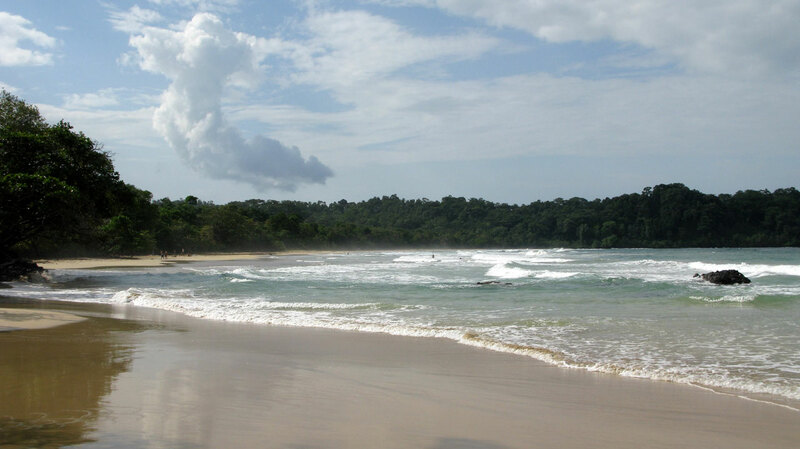 Wizard beach on Isla Bastimentos, Panama. Going for a dive off of Bocas, there’s a surprisingly healthy reef with tons of marine life. 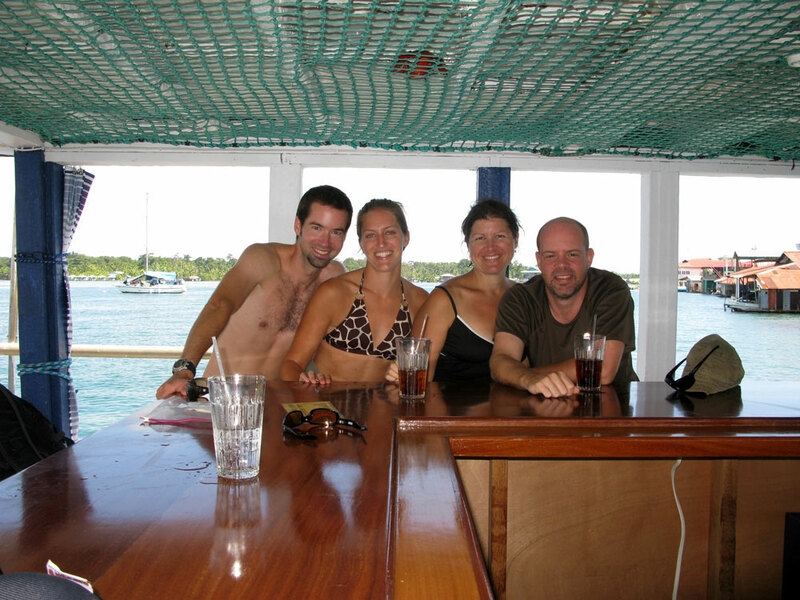 With our new friends Tamsin & Paul after diving. PS: Happy Birthday Mom!!! I hope your present arrives intact and on time! 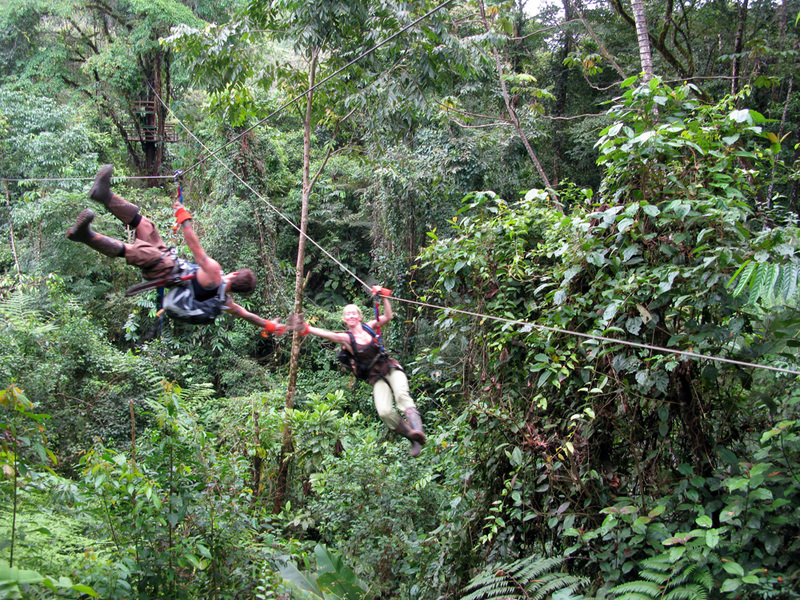 We would totally visit you in a tree house, do they make kiddie zipline harnesses?? Also, liked the Robin Hood quote, miss you little bro! C’est toujours intéressant de vous lire et de voir vos magnifiques photos. Just catching up. The tree houses are tempting. Glad y’all are taking full advantage of this trip! So glad you & Caro got to visit with Matt & Erica. They are great hosts and I’m sure they loved the company for Thanksgiving week. I’m just reading the post a few months lates I know….